An audit of the HadCRUT4 dataset, the primary global temperature database used by the Intergovernmental Panel on Climate Change (IPCC) has found multiple errors. HadCRUT4 is also the dataset at the center of “ClimateGate” from 2009, managed by the Climate Research Unit (CRU) at East Anglia University. The paper, An Audit of the Creation and Content of the HadCRUT4 Temperature Dataset by John McLean (PhD), was first published as a PhD thesis and now as a book. Get the book for $8 here. Read the original thesis here (free download). The audit found more than 70 areas of concern about data quality and accuracy. Australian researcher John McLean says that HadCRUT4 is far too sloppy to be taken seriously even by climate scientists, let alone a body as influential as the IPCC or by the governments of the world. The Hadley data is one of the most cited, most important databases for climate modeling, and thus for policies involving billions of dollars. McLean found freakishly improbable data, and systematic adjustment errors, large gaps where there is no data, location errors, Fahrenheit temperatures reported as Celsius, and spelling errors. Almost no quality control checks have been done: outliers that are obvious mistakes have not been corrected. For instance, one town in Columbia spent three months in 1978 at an average daily temperature of over 80 degrees C (176 F). One town in Romania stepped out from summer in 1953 straight into a month of Spring at minus 46°C. These are supposedly “average” temperatures for a full month at a time. St Kitts, a Caribbean island, was recorded at 0°C for a whole month, and twice! Temperatures for the entire Southern Hemisphere in 1850 and for the next three years are calculated from just one site in Indonesia and some random ships. Sea surface temperatures represent 70% of the Earth’s surface, but some measurements come from ships which are logged at locations 100km inland. Others are in harbors which are hardly representative of the open ocean. When a thermometer is relocated to a new site, the adjustment assumes that the old site was always built up and “heated” by concrete and buildings. In reality, the artificial warming probably crept in slowly. By correcting for buildings that likely didn’t exist in 1880, old records are artificially cooled. Adjustments for a few site changes can create a whole century of artificial warming trends. The monthly mean temperature in September 1953 at Paltinis, Romania is reported as -46.4 °C (in other years the September average was about 11.5°C). At Golden Rock Airport, on the island of St Kitts in the Caribbean, mean monthly temperatures for December in 1981 and 1984 are reported as 0.0°C. But from 1971 to 1990 the average in all the other years was 26.0°C. Bad data and bad modeling assumptions make IPCC temperature simulations diverge widely from really. That’s why we should not believe the IPCC when they cry “wolf” and say it’s the end of the world unless we give them billions of dollars and get rid of fossil fuels. The primary conclusion of the audit (as noted by Anthony Watts) is that the dataset shows exaggerated warming and that global averages are far less certain than have been claimed. 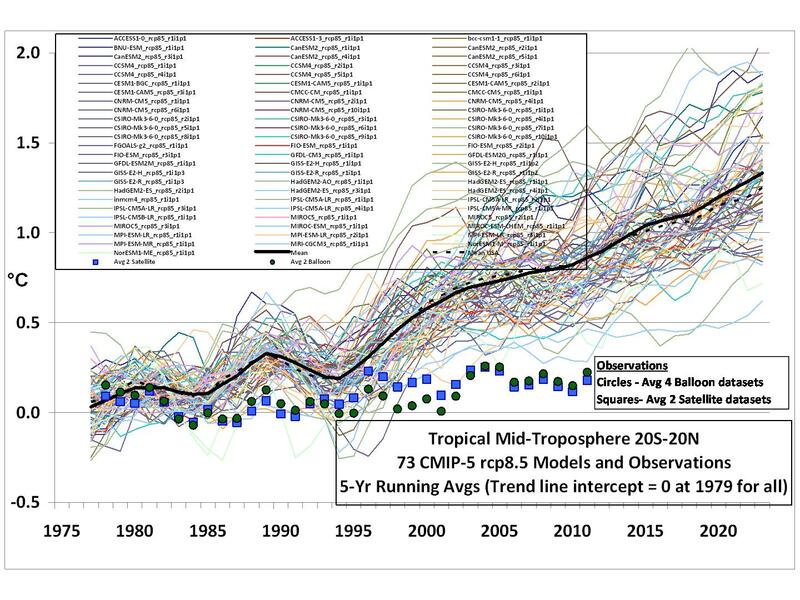 One implication of the audit is that climate models have been tuned to match incorrect data, which would render incorrect their predictions of future temperatures and estimates of the human influence of temperatures. Another implication is that the proposal that the Paris Climate Agreement adopt 1850-1899 averages as “indicative” of pre-industrial temperatures is fatally flawed. During that period global coverage is low – it averages 30% across that time – and many land-based temperatures are very likely to be excessively adjusted and therefore incorrect. Why is it that a PhD student working from home can find mistakes that the British Met Office, a £226 million institute with 2,100 employees, could not. Significantly, the Met Office, in a statement, said they do not disagree with any of his claims. Posted in Climate change, Politics and tagged Climate change, global warming, IPCC on October 16, 2018 by wryheat2. Three senior House Democrats asked U.S. teachers to destroy a book written by climate scientists challenging the environmentalist view of global warming. A cornerstone of California’s battle against climate change was upheld by a state appeals court that ruled the cap-and-trade program does not constitute an unconstitutional tax, as some business groups had claimed. The 2-1 decision from the 3rd District Court of Appeal in Sacramento does not eliminate all the legal and political questions that have dogged the program, which requires companies to buy permits to release greenhouse gases into the atmosphere. A coalition of states filed a legal challenge against the Trump administration’s decision to roll back a slew of Obama-era climate regulations. Democratic attorneys general and environmentalists are suing the Trump administration for delaying the implementation of federal energy efficiency regulations for household appliances and other equipment. A study led by an Engineering Doctorate student at the University of Surrey has found that the carbon footprint of crime over the last 20 years has fallen. The study, published in the British Journal of Criminology, applied estimates of the carbon footprint of criminal offences to police-recorded crime and self-reported victimization survey data, to estimate the carbon footprint of crime in England and Wales between 1995 and 2015. (Read more) It’s nice that criminals are being more politically correct. Former chief scientist Sir David King admitted he was wrong in advising the U.K. government to encourage diesel vehicles to fight global warming. King said the government overestimated the effectiveness of its programs to encourage diesel vehicles. King was the U.K.’s chief scientific adviser from 2000 to 2007 and until recently a special representative for climate change. King advised the U.K. government to push programs to reduce carbon dioxide (CO2) emissions and concluded that switch to diesel cars would be better for the environment. That “economic development system” Figueres talks about is capitalism. The UN is attempting to transform that to global socialism governed by the United Nations. In a series of conferences over the past few years, the UN has been trying to get signatories to a legally binding treaty on climate change in which countries promise to decrease carbon dioxide emissions and western countries agree to pay huge sums to developing countries (through the sticky fingers of UN officials) to save those developing countries from the imagined ravages of global warming. Figueres praised President Obama’s stance on climate change and Obama’s gift of $3 billion to the UN Climate Fund. Posted in Climate change, Politics and tagged Climate change, economy, Energy, global warming, IPCC on March 8, 2015 by wryheat2. 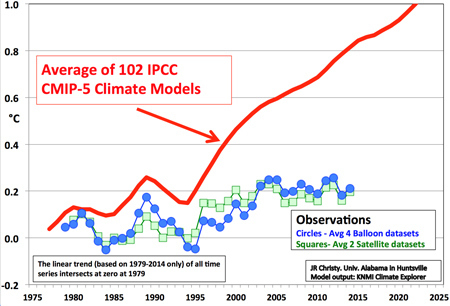 The IPCC’s new synthesis report published on November 2 puts alarmism above accuracy. There are actually two versions of the report, a “summary for policy makers” and a long version. The IPCC claims that renewable energy sources such as wind and solar must become 80% of the power sector by 2050 or the world will face “severe, pervasive and irreversible damage.” The IPCC also says that fossil-fuel power generation without carbon capture and storage technology must be “phased out almost entirely by 2100.” Welcome to the stone age. In five major reports since 1990, the IPCC has published thousands of pages of material, none of which provide any physical or observational evidence that our carbon dioxide emissions have a significant effect on global temperature. All their dire predictions are based on “garbage-in-garbage-out” computer modeling. The first concerns the subject of species extinction. In the 2013 IPCC main report, no predictions were made on to what extent species were threatened, demonstrating that too little is known to make reliable forecasts. But the latest synthesis report claims species have already began dying off due to climate change. Capture of the U.S. Senate in the recent election does not bode well for the IPCC. Not only is it unlikely that a Republican senate would ratify a reincarnated Kyoto-like treaty, but U.S. funding for the IPCC may be cut off. As reported in UN Tribune: “The current Senate bill on funding for state and foreign operations includes $11,700,000 for the Intergovernmental Panel on Climate Control (IPCC) and the UN Framework Convention on Climate Change (UNFCC). The bill was approved by the current Democrat-controlled sub-committee in June but has yet to be put to a full vote. However, the House version of the bill passed by a Republican-controlled sub-committee, also in June, states that ‘none of the funds in this Act may be made available for the Intergovernmental Panel on Climate Change/United Nations Framework Convention on Climate Change.’” That almost $12 million is about one-third of the IPCC budget. The IPCC is a political body that should be allowed to die. The IPCC released their “synthesis report” today. The long awaited conclusion to their massive multi-hundred billion dollar industry’s belief that they need to keep getting paid. I have listed the authors from the front page. Take a few minutes and look up some of the names on this list, copy their resume’s into the comments below. Anecdotes are appreciated. My contention is that AGW is an industry, alarm is their product, their personal pay depends on more study and extreme conclusions. Without yet checking, I believe that nobody on this list is conservative or moderate politically and the message is uniformly more government, more tax and more study. The Obama administration has recently claimed that climate change “once considered an issue for the distant future, has moved firmly into the present” and “climate-related changes are outside of recent experience.” President Obama was referring to extreme weather events and claims that recent extreme weather is unprecedented. Obama’s contention is demonstrably false. James Marusek has published a huge list of historical weather incidents beginning in the year 2 A.D. His PDF file is 1400 pages (18Mb). Clearly, extreme weather such as droughts, floods, and storms that are occurring now are nothing new and contrary to Obama’s claims, the frequency and intensity of these events are not on the rise, see my post: National Climate Assessment = science fiction and politics. Last fall they released a report on the physical science of climate change. That report may be downloaded as a Summary for Policy Makers (22 pages) and CCR-II Physical Science (Ca. 1,000 pages, 20Mb) are available for free download. I summarized this report in a previous post. Later this month, NIPCC will publish another volume concerning human welfare, energy, and policies. • Global climate models are unable to make accurate projections of climate even 10 years ahead, let alone the 100-year period that has been adopted by policy planners. The output of such models should therefore not be used to guide public policy formulation. • Neither the rate nor the magnitude of the reported late twentieth century surface warming (1979–2000) lay outside the range of normal natural variability, nor were they in any way unusual compared to earlier episodes in Earth’s climatic history. • Solar forcing of temperature change is likely more important than is currently recognized. • No unambiguous evidence exists of dangerous interference in the global climate caused by human-related CO2 emissions. In particular, the cryosphere is not melting at an enhanced rate; sea-level rise is not accelerating; and no systematic changes have been documented in evaporation or rainfall or in the magnitude or intensity of extreme meteorological events. • Any human global climate signal is so small as to be nearly indiscernible against the background variability of the natural climate system. Climate change is always occurring. • A phase of temperature stasis or cooling has succeeded the mild warming of the twentieth century. Similar periods of warming and cooling due to natural variability are certain to occur in the future irrespective of human emissions of greenhouse gases. • Atmospheric carbon dioxide is not a pollutant. It is a non-toxic, non-irritating, and natural component of the atmosphere. Long-term CO2 enrichment studies confirm the findings of shorter-term experiments, demonstrating numerous growth-enhancing, water-conserving, and stress-alleviating effects of elevated atmospheric CO2 on plants growing in both terrestrial and aquatic ecosystems. • The ongoing rise in the air’s CO2 content is causing a great greening of the Earth. All across the planet, the historical increase in the atmosphere’s CO2 concentration has stimulated vegetative productivity. This observed stimulation, or greening of the Earth, has occurred in spite of many real and imagined assaults on Earth’s vegetation, including fires, disease, pest outbreaks, deforestation, and climatic change. • There is little or no risk of increasing food insecurity due to global warming or rising atmospheric CO2 levels. Farmers and others who depend on rural livelihoods for income are benefitting from rising agricultural productivity throughout the world, including in parts of Asia and Africa where the need for increased food supplies is most critical. Rising temperatures and atmospheric CO2 levels play a key role in the realization of such benefits. • Terrestrial ecosystems have thrived throughout the world as a result of warming temperatures and rising levels of atmospheric CO2. Empirical data pertaining to numerous animal species, including amphibians, birds, butterflies, other insects, reptiles, and mammals, indicate global warming and its myriad ecological effects tend to foster the expansion and proliferation of animal habitats, ranges, and populations, or otherwise have no observable impacts one way or the other. Multiple lines of evidence indicate animal species are adapting, and in some cases evolving, to cope with climate change of the modern era. • Rising temperatures and atmospheric CO2 levels do not pose a significant threat to aquatic life. Many aquatic species have shown considerable tolerance to temperatures and CO2 values predicted for the next few centuries, and many have demonstrated a likelihood of positive responses in empirical studies. Any projected adverse impacts of rising temperatures or declining seawater and freshwater pH levels (“acidification”) will be largely mitigated through phenotypic adaptation or evolution during the many decades to centuries it is expected to take for pH levels to fall. • A modest warming of the planet will result in a net reduction of human mortality from temperature-related events. More lives are saved by global warming via the amelioration of cold-related deaths than those lost under excessive heat. Global warming will have a negligible influence on human morbidity and the spread of infectious diseases, a phenomenon observed in virtually all parts of the world. These reports are supported by thousands of peer-reviewed papers. Posted in Climate change and tagged biology, Climate change, global warming, IPCC, science on March 30, 2014 by wryheat2. The London Telegraph claims to be in possession of a leaked UN IPCC report which says in effect that growing crops to make “green” biofuel [ethanol and biodiesel] harms the environment and drives up food prices.” See Telegraph story here. The UN will publish the report on March 31. It will be interesting to see if the final version is the same as the “leaked” version. If so, then the story will represent a reversal of UN “scientific consensus” on biofuels. As I noted in an ADI story last November, “…the ethanol era has proved far more damaging to the environment than politicians promised and much worse than the government admits today…As farmers rushed to find new places to plant corn, they wiped out millions of acres of conservation land, destroyed habitat and polluted water supplies…Five million acres set aside for conservation — more than Yellowstone, Everglades and Yosemite national parks combined — have vanished on Obama’s watch.” The biofuels industry is heavily subsidized and about 40 percent of U.S. corn crop goes to produce ethanol rather than being used as food. Posted in Climate change, Energy and tagged biofuels, ethanol, IPCC, UN on March 27, 2014 by wryheat2. It was an interesting coincidence of reporting contrasting two takes on global warming. In contrast, an editorial from the Center for the Study of Carbon Dioxide and Global Change: “Needing More Food, but Biting the Hand that Feeds Us” notes that UN policy to reduce carbon dioxide emissions goes directly against efforts to produce more food for a growing population. Also, there is “the significant body of work that reveals that as the atmosphere’s CO2 concentration rises, the various temperatures at which different plants photosynthesize most proficiently rise right along with it” as they described well over a decade ago in a report entitled “The Spector of Species Extinction: Will Global Warming Decimate Earth’s Biosphere?”. The UN IPCC is a political organization not a scientific one. Their entire existence depends upon presenting scary scenarios. led to safety) by menacing it with an endless series of hobgoblins, all of them imaginary.” – H. L.
Posted in Climate change, Politics and tagged Climate change, food scarcity, IPCC on March 18, 2014 by wryheat2. Scientists Craig D. Idso, Robert M. Carter, S. Fred Singer, and Willie Soon have released a lengthy critique of the recently published Intergovernmental Panel on Climate Change (IPCC) Summary for Policymakers (SPM). You can download the 18-page critique here. Below I summarize some alarmist claims that the IPCC has retreated from or downplayed. The IPCC finally concedes that there has been a 15-year “pause” in global warming in spite of carbon dioxide increasing by 7 percent. The IPCC also concedes that the rate of global warming has decelerated since 1951 although carbon dioxide has increased 26 percent since that time. The “hockey stick” has disappeared. The IPCC now admits there was a Medieval Warm Period that was just as warm as late 20th Century temperatures. In a contradiction to its own climate models, the IPCC now admits that Antarctic sea ice has been increasing by 1- to 2 percent per decade since 1979. The IPCC admits that its climate models did not predict nor can they reproduce the recent lack of warming. For the first time, the IPCC admits that solar factors may play a determinative role in short-term climate variability. The IPCC has decreased the lower number in the range for equilibrium climate sensitivity, i.e., the amount of warming they expect to result from a doubling of atmospheric CO2. However, unlike in previous reports, the IPCC did not publish a “best guess” of what the actual number is. The lower value brings the sensitivity closer to what has been estimated by many non-IPCC scientists. The IPCC now has “low confidence” that global warming will result in dangerous increases in the magnitude or frequency of extreme climatic events including cyclones and droughts. As I’ve shown in a previous post, the IPCC does not now think that warming will release carbon dioxide from permafrost nor do they think that there will be a catastrophic release of methane from clathrates in the ocean.